Companies spend millions on legal compliance training and initiatives to eliminate workplace drama and the resulting low morale and lawsuits, but don't always get the results they want. Most organizations understand that simply checking legal compliance boxes around sexual harassment, bias, etc. isn't enough, but are at a loss on how to implement solutions, especially in today's post-#MeToo world. Patti Perez is an attorney, HR expert, trainer, and former state regulator, who has conducted over 1,200 workplace investigations. In this unique book, she explains the secret to avoiding all forms of drama, legal exposure, and low morale: A healthy workplace culture. Patti combines the lessons learned from 25 years of professional experience with robust data from behavioral science research to debunk common myths, including the belief that a focus on legal compliance leads to a healthy workplace culture. (In fact, it increases the likelihood of getting sued). 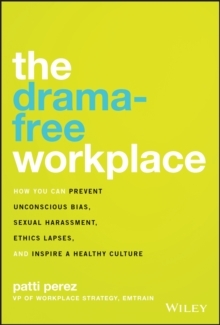 The Drama-Free Workplace includes a section with easy-to-understand causes, effects and solutions to problems related to: Sexual harassmentBias and diversityEthics lapses The book also includes helpful information on: Becoming an organization that values and practices fearlessness, fairness and freedomAnticipating situations that give rise to drama, with detailed advice on how to prevent it from happeningUsing emotional intelligence to communicate more precisely and persuasively about sensitive, controversial topics in the workplace Finally, the book's DIY section guides companies on how to: draft and enforce helpful policies (that employees will actually read and *want* to follow)design and deliver powerful and effective training programsinvestigate and resolve claims of sexual harassment and other types of misconduct. Together, these practical tools will help all your employees feel valued and motivated, and keep drama, disengagement, and lawsuits, away.